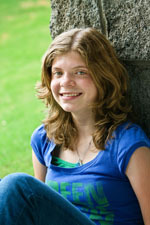 Veggie Teens: A Cookbook and Guide for Teenage Vegetarians was written by Elyse May, a teenage vegetarian, when she was 14 years old - and updated when she was in college! It started as a school project but with a little help from her mom, a family physician, and her dad, a professional chef, it became a mission to help other teenage vegetarians and their families. The 2nd edition of Veggie Teens features new photography and re-tested recipes in a convenient e-book! •	Full color photos for every recipe - tons of new photos in the 2nd edition! •	The e-book is the 2nd edition with tons of new, improved photos! "I am so impressed! The recipes look great, the page layout and pictures are very eye appealing and I love the Chef's Notes, Doctor's Notes, and Teen Tips." "What a wonderful and thorough guide for teens interested in exploring vegetarianism and families looking to increase their consumption of plant foods. Elyse's pictures of cooking techniques for new cooks and the section on foods that contain hidden animal products are especially helpful. The book is loaded with excellent nutritional information and best of all, tons of simple, satisfying and scrumptious recipes (not to mention healthful)--many of which can be prepared in minutes." "I am absolutely loving the soups and salads section - these are the types of recipes I'm looking for, along with the sides, extras, and main eats. Fortunately, I don't have to pick just one! I love all the photos including the finished product as well as the various steps that go into a task. I also appreciate the straight forward way Elyse has explained how to do things." I know from experience with my middle daughter that tweens go through this phase. And while I have to admit I don’t know much about being a vegetarian, my daughter has taken the steps to find out more about it. This cookbook and guide has been very helpful to her. From the Culinary How To, like how to poach an egg and how to make meringue to charting out the different types of vegetarians, this cookbook and guide is full of important information. And we made the Bluberry Peach Almond Crisp and it was awesome!!! My teen and our family loves Veggie Teens! Thanks to Elyse for writing it (and to her parents for their assistance too) - great job! We are not vegetarian, but mindful eaters, and this is a excellent resource. We are using "Veggie Teens" as an elective for my 15 yr old son's homeschool! He loves to cook and I wanted to introduce this meat-lover to other protein sources and the tips that the "Chef" and the "Doctor" give. But I think he likes that the "Teen" always has the last word!